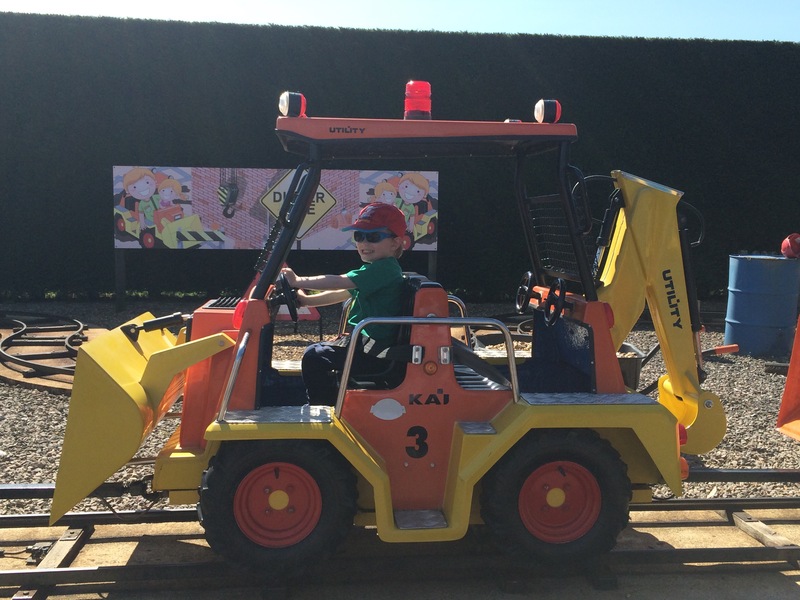 Peppa Pig World & Paultons Park – Magical for Kids! It’s taken a while for this post to appear. I was adamant that we were in no hurry to visit Peppa Pig World. However, I caved in and decided to be a good parent instead and sacrifice my leisure time for my little boy’s; what a great decision and how small a sacrifice. My preconceived ideas, expecting a tacky, rip-off joint were so far from reality that I can safely say an enjoyable experience was had by one and all. I’ve got five minutes peace, sitting by George’s Spaceship Playzone (a lovely clean, well equipped age-appropriate softplay to you and me), whilst Mr PCG plays with Alexander. We are having five minutes out of the glorious sunshine but to be fair, it started out overcast and the atmosphere and excitement really did bring a sparkle to the morning anyway. First things first; let’s get some facts straight. Peppa Pig World is actually part of a bigger amusement park – Paultons Park– a family-owned park, over thirty years old with sixty rides. Set on the edge of the New Forest. less than two hours from London. It can be done in a day but we stayed two nights and made a mini-break of it; visiting the New Forest, seeing the gorgeous wild ponies and returning (unplanned) again the next day because we’d had so much fun. It’s not cheap to get in but there are early booking discounts and children under 1 metre go free which means that most three year-olds won’t need to pay. However, having now visited, I can safely say that it’s great value because you get three parks in one. I won’t go on about the other parts of Paultons but suffice to say that it is small enough to be easy to navigate around, there is something for every age and there is nothing to be seen of the tacky, everything-costs-extra, run down amusement park that you might expect. Brilliantly run and well cared for, staff everywhere helping on and off rides in a very civilised and more importantly safe fashion and also with a big focus on environmental friendliness and green spaces. There are beautiful gardens, loads of places for picnics, a Water Kingdom, aviaries, penguins (go for feeding time!) and so much more. Peppa Pig World feels brand spanking new. An addition to the original park, it is a revelation. A wonderfully-designed theme park with rides all specifically geared towards the age group that worships the TV program so much. Rides are mini versions of what you might expect for adults, all with relevance to Peppa Pig. From Grandpa Pig’s Boat Trip, to Peppa’s Balloon Ride, Windy Castle, Muddy Puddles (a reference to one of the episodes for those not in the know and a water splash play area – bring costumes and towels! ), Miss Rabbit’s Helicopter Flight, Daddy Pig’s Car Ride and a whole lot more. All rides are safe, colourful, enchanting even. Created so that adults ride alongside their children, I have to admit that I really enjoyed myself! For anyone hesitating, I urge you to go. It’s in a beautiful part of the world, the park itself is a revelation, it’s not too commercial and adults will enjoy it too! Also, a new addition and themed attraction this Easter is Critter Creek; a mini-land of Curious Critters; complete with Cat-O-Pillar roller coaster, Expedition Express train ride and Beastie Burrow – a giant tree trunk where families can step inside to come to face to face with fascinating fish, bugs and reptiles. Set on the edge of the New Forest, it’s less than two hours from London. It can be done in a day but we stayed two nights and made a mini-break out of it; visiting the New Forest, seeing the gorgeous wild ponies and returning (unplanned) to Paultons again the next day because we’d had so much fun. There are many places to stay but I would highly recommend Hotel Terra Vina, five minutes down the road, super child-friendly and a haven for foodies and oenophiles – see, It’s not just all about the kids! Check out the video I made here..
Hotel Terra Vina, The New Forest – Try It Before Anywhere Else! Pregnant? – The One Test That Everyone Needs to Have.